What chance for MeeGo in the age of the iPad? Today is Apple iPad day in the UK; but the portable device I’ve been playing with is not from Apple. Rather, I downloaded the first release build of MeeGo, proudly labelled 1.0, and installed it on my Toshiba NB 300 netbook, which normally runs Windows. You can choose between the evil edition with Google Chrome; or the free edition with Chromium – I picked the Chrome version. I did not burn any bridges: I simply copied the image to a 2GB USB memory stick and booted from that. There was one oddity: the USB boot only worked when using the USB port on the right by the power socket, and not from the one on the left edge of the netbook. It is a common problem with USB, that not all ports are equal. 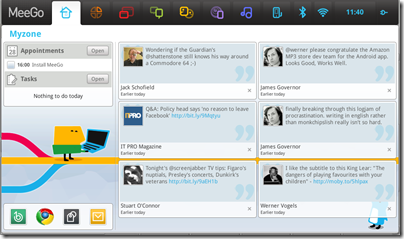 MeeGo is a joint project from Intel and Nokia, formed by the merging of Intel Moblin and Nokie Maemo. It is a version of Linux designed for mobile devices, from smartphones to netbooks, though this first release is only for netbooks. Further releases are planned on a "six-month cadence", and a wider range of devices including handsets and touch-screen tables is promised for October. First impressions are mixed. Starting with the good news: performance is great, the user interface is smooth and polished, and less child-like and cutesy than the last Moblin I looked at. The designers have really thought about how to make the OS netbook-friendly. Applications run full-screen, making the best use of the limited screen size. Navigation is via a toolbar which slides into view if you move the mouse to the top of the screen. From here, you can switch between "Zones" – in effect, each zone is a running applications. Not difficult but laborious; I found myself using Alt-Tab for switching between applications. I also miss the Windows taskbar, despite the screen space it occupies, since it helps to have a visual reminder of the other apps you have running. There is also a home page which is a kind of local portal, showing showing current Twitter status (once I had added my Twitter account), application shortcuts, current appointments, recent web history, and other handy shortcuts. Getting started was relatively quick. I soon figured out that the Network icon in the toolbar would let me configure wireless networking. It look me a little longer to find the system preferences, which are found by clicking the All Settings button in the Devices menu. Here I was able to change the keyboard layout from US to GB, though since it does not take effect until you logout, and I was using the live image which does not save changes, I was still stuck with the wrong layout. A terminal – essential for serious Linux users – can be found in the System Tools section of the Application menu. I needed a password to obtain root access, which I discovered is set by default to "meego" in the live image. I presume this is a feature of the live image only, as this would otherwise be a serious security risk. I soon found annoyances. This may be version 1.0, but it is described as a "core" release and seems mainly intended for software developers and I presume device manufacturers who are getting started. The selection of pre-installed applications is very limited, and does not include a word processor or spreadsheet. There is a "Garage" utility for installing new apps, but although it seems to offer Abiword and Gnumeric, I could not get the links to resolve. I cannot find an image editor either. Without basic apps like this, MeeGo is not something I could rely on while out and about. I was surprised to find no link to the Intel AppUp store, which will offer applications for MeeGo, and when I tried to install the AppUp beta I got failed dependencies. I optimistically tried to install Adobe AIR; no go there either. There must be other ways of getting apps installed – this is Linux after all – but I was looking for a quick and easy route. Adobe Flash 10.1 is installed and works, though not on my first attempt. Trying to play a Youtube video made Chrome unresponsive, and I could not get Flash content to play on any site. Rebooted and all was well. 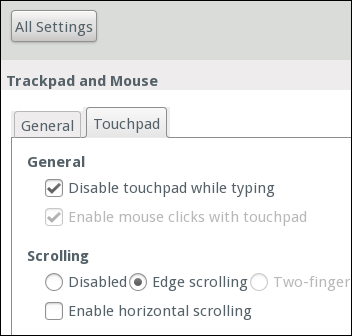 A big irritation for me is that you cannot disable tapping on the touchpad. There is a checkbox for it in settings, but it is both ticked and grayed so you cannot change it. I detest tapping since you inevitably tap by accident sometimes, on occasion losing work or just wasting time. No doubt there is some setting you can change though the terminal but I haven’t had time to investigate. It is also possible that doing a full install to hard drive would fix it, as the live image does not save changes. Nevertheless, the progress is encouraging and if development continues at this pace I can see MeeGo becoming a strong alternative to Windows on netbooks: faster, cheaper, and better optimized for this kind of device. Even against the Apple iPad, I can see the attraction of something like a MeeGo netbook: freedom, Flash, value for money, and a keyboard. The big question though: what chance has MeeGo got in the face of competition from Apple, Google with Android, and Microsoft with Windows? It seems to me that all these three are safe bets, in that they are not going away and already have momentum behind them. Will the public also make room for MeeGo? I like it well enough to hope it succeeds, but fear it may be crowded out by the competition, other than for Nokia Smartphones. Spare a thought for iTunes user Peter Bilderback. His account was hacked and someone downloaded almost a $1000 worth of items from the iTunes store using his account. Bad stuff, but it happens. Bilderback wonders why Apple did not query the purchase of iPhone apps, when it knew that he had no iPhone – you would have thought that Apple’s closed system would be ideal for this scenario at least – but never mind, the credit card company spotted the suspicious activity and disputed the charges with Apple. When I contacted Apple about what happened they were totally unhelpful. Now they seem to have closed my iTunes account entirely, and I can no longer access any of the protected AAC music files, television shows or movies that I “purchased” from iTunes in the past. They are as good as gone. iTunes customer service does not respond to my emails inquiring about how to get my account reactivated. I cannot get through to anyone via phone, I just get a message directing me to their customer service website, and I can’t really use that because as far as Apple is concerned, I don’t have an account with them anymore. With such a clear-cut case, you would think that Bilderback would eventually recover his purchases, but he says the incident “has been going on for three months now with no resolution in sight”. The case highlights the difference between the old world of buying physical media like a CD, which comes with a transferable licence for personal use, and the new one where you download the media and buy a licence that is more restrictive, sometimes combined with technical content protection that further limits how you can enjoy your purchase. That said, much iTunes content is not DRM-protected so presumably Bilderback can still get access to that. The other aspect of this story is about customer service. It is a common story: individual versus large corporate entity, and the difficulty in getting through to anyone with both the willingness to listen and the power to do anything about a problem. I guess he could try emailing Steve Jobs? Sometimes you get a reply. The UK government today announced that Becta, a government body to “promote technology in learning”, is to be closed. Becta stands for “British Educational Communications and Technology Agency”. I have mixed feelings about this, though in a period when severe cutbacks are required a body like Becta is hard to justify. 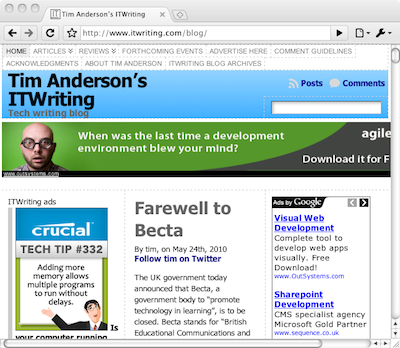 I first came across Becta in the context of the debate about Office Open XML, Microsoft Office and Open Office. Becta, which claims to provide “rigorous research and evaluation”, came up with a full report on Microsoft Vista and Office 2007. These are products which I know a lot about, and I thought the report was poor. I liked the fact that Becta was positive towards open source; but disliked the uncritical advocacy which it seemed to indulge in at times. My other observation comes from attendance as a speaker at the Education conferences organised by Forum Events. When I asked what delegates thought of Becta, I found that most attendees, in seminars on open source and on cloud computing, had not heard of it. I think the way IT is handled in education is a key issue for our industry and economy; but from my limited contact did not see evidence that Becta was achieving its goals. Update: this post is based on obsolete beta code. Please go to the updated version here. 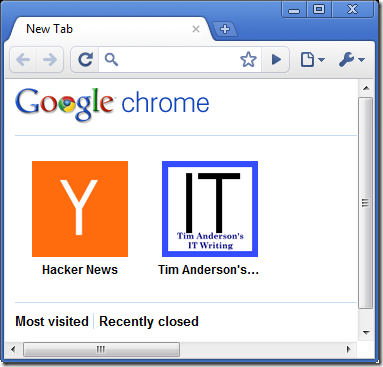 When I read Patrick Aljord’s blog on how to create Chrome Apps I thought, “that looks easy”. So I installed the dev channel version of Chrome as advised here, though on a VM just to be safe, and set about creating my own. 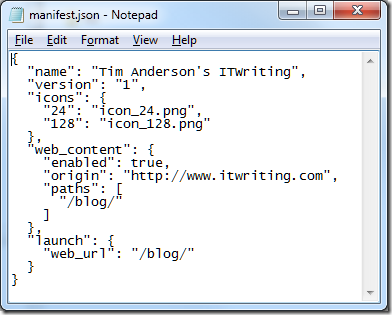 Well, WordPress is a web application; so my example is this blog. 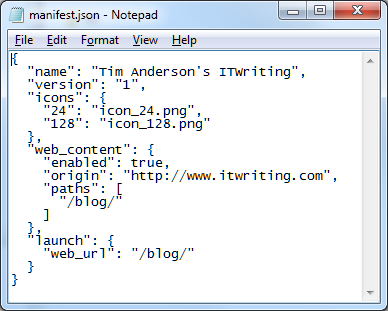 I created a manifest in Notepad. Next, using my artistic skills, I made two icons of the required size: 24×24 and 128×128. I ran the dev. 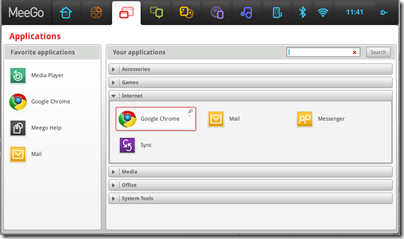 build of Chrome using the –enable-apps switch. On the Extensions tab there are tools for building a .crx, which is the container for a Chrome Web App. I built the app, then installed it. You get a generic warning about the extension. I was surprised not to see a stronger complaint about my app having no authenticated signature – it could be from anywhere. I guess this may be changed for the final release. 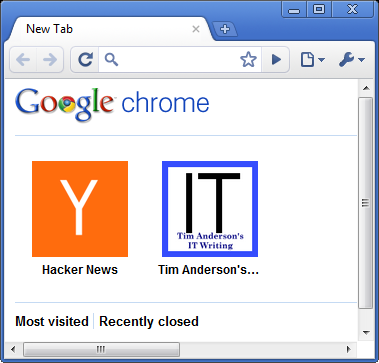 After installing, the app appears in the Chrome New Tab page. You can try my web app here. 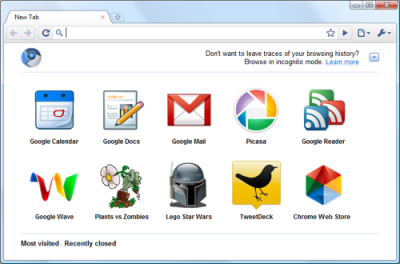 Apps get pride of place on the default Chrome Home page. Apps can be installed from the forthcoming Chrome Web Store, with user reviews, a payment model, and so on. Apps can have extra permissions. Apps can be locally installed as “serverless” apps – this is huge, especially for the forthcoming Chrome OS which has no other provision for local applications. Incidentally, if you try installing an app into the current standard build of Chrome, it installs as an extension but does not do anything. I also had to omit the “permissions” section of the manifest, otherwise I got an invalid permissions error when installing. In the developer build all was fine. I tried dragging my app from Chrome to the desktop to make a shortcut. It worked, but simply created a standard web shortcut, which opens in your default browser, not necessarily in Chrome. 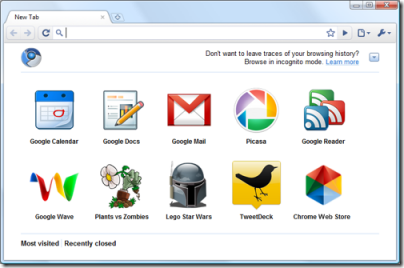 It is all so easy that it will make sense for almost anyone to create a Chrome Web App from their web property. Which also means there will be plenty of junk web apps around. I’m not clear exactly how the Web Store will work. While I would love to sell URLs for money, they are not inherently of any value, though a serverless app is different. Presumably the normal thing would be to sell some sort of subscription, which implies registration and user authentication. No doubt everything will work smoothly if you use a Google ID as your authentication provider, though I hope Google will also provide for alternative systems. Google advances its platform – or should that be advances the Web? Yesterday Google presented its latest platform innovations at the Google I/O conference in San Francisco. Its strategy is relatively clear: to improve web applications so that you can do everything you need in the browser. The client pieces are HTML 5 – though bear in mind that this is not yet a fixed standard – and especially the Chrome browser, whether installed on a traditional operating system or delivered on a Chrome OS device. Announced yesterday, the WebM video and audio format. This includes VP8, acquired with On2 Technologies and now open source, as well as Vorbis audio and the Matroska multimedia container. 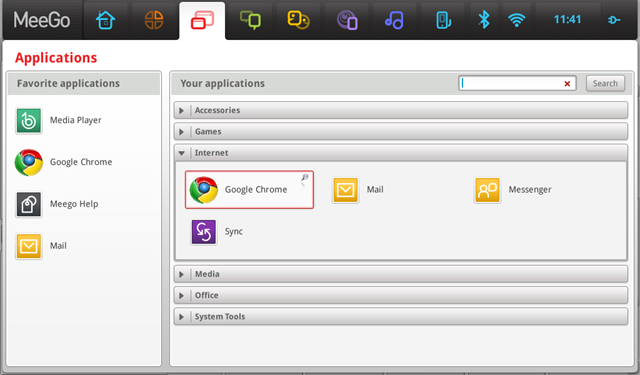 The Chrome Web Store, also announced yesterday, which will be an App Store equivalent for web applications. Web Store apps are “installable” which may mean little more than a shortcut in the browser, similar to a bookmark or favourite link. However, there will be a payment infrastructure as well as ratings and user reviews. The Google Font API and Directory. This is big news. Most of us stick to the same old web fonts, or use images, or a plug-in like Flash or PDF, for going beyond the standard browser fonts. Using Google’s API, it is easy to include any font in the new directory, with nothing more than a specially crafted CSS link. The Google Font API hides a lot of complexity behind the scenes. Google’s serving infrastructure takes care of converting the font into a format compatible with any modern browser (including Internet Explorer 6 and up), sends just the styles and weights you select, and the font files and CSS are tuned and optimized for web serving. Until the announcement of VMforce and today’s announcement, Java developers lacked a PaaS destination to which they could easily deploy their applications. This was an important gap that threatened to become a danger to the long-term future of Java. I’m delighted that VMware/SpringSource is leading the charge to fill this gap. SQL database support on App Engine gives enterprise developers access to the full capabilities of a dedicated relational database, without the headache of managing it. though Google adds that this is a “premium service” which may come at extra cost. According to the roadmap, this is coming in Q3 2010. While there is a lot to take in, there is a consistent theme: making the web and browser platform more capable, and making desktop applications and on-premise servers less necessary. Whereas Apple aims to lock us into its devices and App Store, Google’s approach is more open. It is happy to give away stuff like the WebM multimedia project and the Font API in order to improve the Web overall; though of course every time we use the Font API Google can record the traffic on our site and mine that data if it chooses to do so. It is in line with the strategy unveiled at the Mobile World Congress in February: a little bit of everything you do. Google will take its cut of any Web Store sales. What is Web and what is Google is deliberately blurred. I still think that the forthcoming Chrome OS is an amazing experiment, and the new offline application support announced yesterday makes sense as an alternative to traditional local applications. A good day for Adobe and Flash, or a bad one? Adobe’s Kevin Lynch demonstrated new HTML 5 capabilities in Dreamweaver, via an add-on pack. As expected, Adobe is becoming a little less Flash-focused in its PR. Google’s emerging platform is a tool opportunity for Adobe. Still, that is a lesser role than establishing Flash as the universal client, a possibility which Apple seems to have killed. Google is supporting Flash, of course, by building it into Chrome, but at the same time things like WebM, Font API, HTML5, and Native Client (shown as the natural client platform for browser-hosted games) undermine the need for Flash. Apple is a problem for Google too. Will native client ever work on iPhone or iPad? WebM? The big question – who will marginalise whom? What is happening with Silverlight on Intel Moblin/Meego? Microsoft and Intel announced today that the two companies have agreed to work together to bring support for Silverlight 3 to Intel’s Atom-based Mobile Internet Devices (MID). These Atom-based devices run on Windows and Moblin, an open source, Linux-based operating system targeted at Atom-based devices. In order to help bring Silverlight content to these devices, Microsoft has provided Intel with Silverlight source code and test suites, and Intel will provide Microsoft with an optimized version of Silverlight for Moblin devices that Microsoft can then redistribute to OEMs. In May, the 1.0 version will be released, and with 1.1 coming out in October, there will be support for Silverlight, Java, and Air. Developers can write native or runtime apps that can be Java-based, Web-based, Silverlight-based, or Air-based. Today, another clue, but not a good one for Silverlight. Intel is holding an application lab on May 26th in San Jose, for developing for the Intel AppUp store, either on Windows or Moblin. On the agenda: C/C++ and Adobe AIR, and the upcoming Adobe AIR SDK for Moblin. No Silverlight. If anyone is going along, and can discover any news about Silverlight on Moblin, I’d be interested to know. Microsoft sues Salesforce.com for patent infringement – but why? Microsoft has filed a patent infringement actionagainst Salesforce.com. My observation is that I have seen Salesforce.com shake up the industry by making its multi-tenant online application and platform work for its customers. Although there are some parallels, the Salesforce.com platform is more radical than Microsoft Azure and has more potential to reduce costs, because it is based on a single shared application, rather than being a hosted platform for custom applications. The differences are not absolute, because the Force.com platform also supports custom applications, and Microsoft also offers multi-tenanted applications, but if you look at the core propositions the distinction is valid. Again, I have no idea what the legal outcome will be, but from a public relations perspective this does not look good for Microsoft. It raises the question: is Microsoft litigating because it cannot succeed in the market? Small companies and patent trolls sue large companies because they have little to lose, and potentially a lot to gain. Large companies show more restraint. I have always assumed that there are thousands of plausible patent infringements among the largest technology companies, and that the industry would descend into a kind of litigation meltdown if all of them were pursued, to nobody’s benefit other than lawyers. The question then: why is Microsoft going after Salesforce.com now?